I wouldn't read this review if I were you. They say that there are two things you never want to see produced—laws and sausages. But there's at least one more: Bible translations. 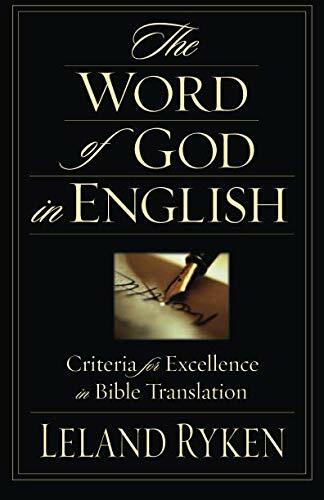 As Old Testament scholar Gordon Wenham says in his blurb for Leland Ryken's The Word of God in English, Ryken's book is "gripping" but "also most disturbing, for Ryken argues that most modern Bible translations sell their readers short." This is hard to hear for believers who have memorized and treasured certain versions of their favorite verses. The translation we're used to seems as sacred to us as Scripture itself. If something's not quite right with the sausage, there's a part of us that would rather not know. The problem isn't with Scripture, it's with language itself. In a recent essay in Harper's, Kitty Burns Florey remarks that trying to get English to conform to the rules of Latin grammar is "something like forcing a struggling cat into the carrier for a trip to the vet." Trying to get Hebrew (which is lusciously poetic) and Greek (which relies heavily on context for the meaning of words) to fit nicely into the parameters of English is similarly problematic. Bible translators have two ways to put the square pegs of Hebrew and Greek into the round hole of English, and those are "essentially literal" and "dynamic equivalent" translations. An essentially literal translation follows the literal meaning and word order of the original language as far as the receptor language allows. A "dynamic equivalent" translation seeks to use the words and phrasing of a receptor language that best captures the meaning of the original language. A common definition is that "essentially literal" means word-for-word, while "dynamic equivalence" is thought-for-thought. The most common criticism of essentially literal versions is that they are "wooden." The most common criticism of dynamic equivalence is that it plays "fast and loose" with Scripture. The founder of dynamic equivalence is Eugene Nida, whose memoir of his 60-plus-year career as a linguist and biblical translation consultant was published recently by John Benjamins. 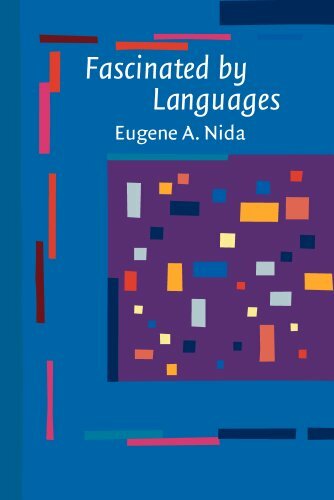 Nida says he spent a lifetime urging translators to "see through and beyond the words to the meaning of the text." After all, Nida writes, "it is rare that key Greek words can or should always be translated the same way. In fact, key words are very likely to have quite different meanings in diverse contexts." And so dynamic equivalence (which Nida describes but doesn't name) is called for. Elsewhere in Africa, Matthew 25 presented a problem. In that passage, Jesus invites the sheep into heaven but banishes the goats to hell. "But in most of sub-Saharan Africa, goats are prized for their resourcefulness, and sheep are often regarded as filthy scavengers," Nida writes. He considered it off-limits to "make the sheep into goats and the goats into sheep," but he told translators to explain the symbolism in a footnote. Spreading branches in the path of a leader is an insult in many parts of Africa, so a footnote was needed to clarify that Jesus' triumphal entry on Palm Sunday was indeed triumphal. Nida also presents word studies from the Greek New Testament, including a partial list of the ways the word logos is rendered in English Scripture. The list includes the figurative title for Christ in John 1:1 ("Word" in English), "reason" in the phrase "the reason for your hope" in 1 Peter 3:15, "financial accounts" in "the servants' accounts" in Matthew 18:23, and a half dozen others. Sarks is similarly versatile, meaning "skin" in Revelation 19:18, "human form" in 1 Timothy 3:16, "humanity" in 1 Peter 1:24, and "race" in Romans 11:14. Nida said he and colleagues once produced a list of 25,000 meanings for the New Testament's 5,000 words. This made Nida skeptical of "the prevalence of 'word-worship,'" which he says "almost always results in skewing the meaning of the original and making artificial the form of the resulting translation." The solution is to find "the closest natural equivalent in meaning and impact."